Hey guys, don't you notice that Chameleon is very underrated in Mortal Kombat. He made is debut in the PC version of Ultimate Mortal Kombat 3 with no backstory. In Mortal Kombat Trilogy, people are questioning if Chameleon is a Saurian because his female counterpart, Khameleon is. He also doesn't have a backstory telling you. Chameleon was added into MK Armageddon because of a great fan demand. Check it out on MK Wiki. Still, there was no information about him being a Saurian. Then, in Mortal Kombat X when you mirror match Reptile, he will ask the other Reptile if he is Chameleon. This could be a clue that Chameleon is a Saurian. If Chameleon is a Saurian then Reptile isn't the last living male Saurian. Don't we already have an unappreciated Reptile who's always treated like a punching bag in story mode? Why don't we concentrate on the good and developed characters we already have instead of doing what Soul Calibur has done? Chameleon is well developed to be honest. Think about it, he has every ninjas moves. 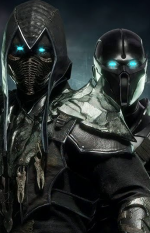 If he was in MKX (which he not) he probably would have Tremors moves. That means he would mimick 8 ninjas. Sounds pretty deadly. <div class="forumQuote"><b>4Charles2014 Wrote:</b><br/>Chameleon is well developed to be honest. Think about it, he has every ninjas moves. If he was in MKX (which he not) he probably would have Tremors moves. That means he would mimick 8 ninjas. Sounds pretty deadly.</div> <br/> <br/>So he's a fraction of Shang Tsung.... that's not being a developed character. <br/> <br/>Being a favorite character of yours doesnt mean he's developed. Do you know what being a developed character means? Reptile was developed in MK2 after his appearance in MK1, where he mimicked moves. Same with Jade in UMK3. Chamelon has always been just that, a mimicker. Nothing more, nothing less. <br/> <br/>Chameleon should only show his face if he can distinguish himself different from all the other ninjas, ESPECIALLY Reptile. We don't need any more half-assed characters. So he's a fraction of Shang Tsung.... that's not being a developed character. Being a favorite character of yours doesnt mean he's developed. Do you know what being a developed character means? Reptile was developed in MK2 after his appearance in MK1, where he mimicked moves. Same with Jade in UMK3. Chamelon has always been just that, a mimicker. Nothing more, nothing less. Chameleon should only show his face if he can distinguish himself different from all the other ninjas, ESPECIALLY Reptile. We don't need any more half-assed characters.